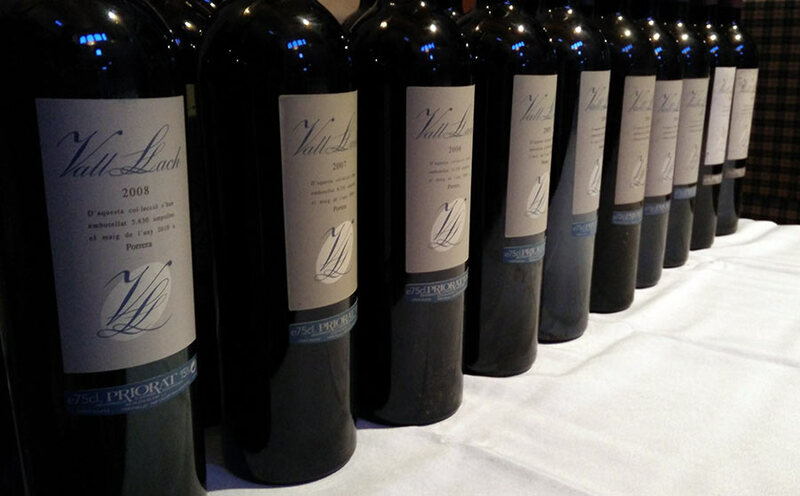 On Saturday, August 29th, Albert Costa, the co-owner and winemaker of Vall Llach in Porrera along with famous folk singer and co-owner Lluís Llach, Priorat held a press tasting that featured a vertical of every single Vall Llach wine made from 1999-2008 and we were only missing the 1998 and 2009 vintages. 1998 was the first vintage and a rather hot year and the blend was very atypical of what would start in 1999 so I assume that’s why we didn’t taste that vintage. So why only until 2008 you might ask? Well, from 2009 on, Albert made the decision to split his flagship wine in to two different lines that would showcase a different aspect of the winery’s best vineyards. The Vi de Vila – Porrera 2009 was the first to be released and is comprised of mostly Carignan along with a smaller proportion of Grenache. The Vi de Finca – Mas de la Rosa 2010 which is mostly Carignan with just a touch of Grenache and Cabernet Sauvignon. Both are excellent and both worth trying if you want to see what Porrera and more to the point, Albert, is capable of producing these days. But these two wines weren’t the stars of the evening. Those were the 10 vintages awaiting all of us that showed the journey to arrive at these two new flagship wines. It’s been an interesting route given that the older vintages, like most in Priorat started with a much greater proportion of French grapes that have slowly given way to what are deemed the “native” grapes of Priorat, namely Carignan and Grenache. This of course elicited a number of random comments from some of the other journalists in attendance such as stating that one of the older vintages was “100% Pomerol”, Pomerol being a Right Bank Bordeaux AOP that is predominantly Merlot and Cabernet Franc most famously known for Château Pétrus which is actually 100% Merlot. This is of course a curious thing to say for wines that, while having some Merlot in the past, have never had it as the dominant player (not even 1/3 of the blend except in 1999) and there’s never been any Cabernet Franc in the Vall Llach. Tasting and writing (somewhat) legible tasting notes for 10 wines in a short time isn’t easy, especially when some of my fellow journalists were more involved in drinking the wines than actually analyzing them. I ended up with a full page of notes for which I was berated as being “a Hemingway”. Not a horrible accusation as he’s one of my favorite authors, but it’s easy to see in some of the other articles that arrived before this one that analysis went out of the went as the window as they made their way through the vintages with either no vintage notes arriving in the end or the 2008 having a succinct, “good” which was probably followed by a lascivious burp and “more please”. In no way am I saying that I’m a better or more learned journalist. I’m just saying that if you plan to actually write something afterwards, there’s no way in hell you’re going to remember the profile of 10 years of the same wine after drinking them for four hours–although I left after two given that Albert was hosting us in his home and I know he gets up early for work. It’s also true that I’m quite lucky to know Albert well and to have gone to the Mas de la Rosa vineyard before (it’s the cover photo of the 2nd edition Priorat book) and so it was easier to just focus on tasting the wines I suppose. It was after all an excellent and memorable evening that Albert put together and the vineyard trips to the old vine Carignan and newer Viognier were stupendous during this last heavy breath of August heat so that we could appreciate the freshness of these two high altitude locations. Again, many thanks to Albert and Lluís for their time and without further ado, the last decade of the wine, Vall Llach. Please note that, like in the past, I’ve used the 20 point scale for a more finite grading. Cloves, dried herbs, tobacco leaves, and a juicy, wet minerality to it with good, present acidity. The primary fruit is still surprisingly present and the tertiary notes have integrated very nicely some time ago. Strong minerality as well like the 1999 but the fruit has reduced a good deal. Excellent balance in the body with a finish that’s a touch short but the blend of dark and red fruits is wonderfully exotic. Vibrant, smooth red fruit aromas of mature cherries. Full in the mouth and very concentrated but the acidity and alcohol are a bit out of whack and fighting each other as it currently sits. Light vanilla aromas with blackberry, laurel, and licorice. In the body all the fruit has fallen out for the most part but the structure is still sound and well-defined. Dark fruit, floral violet elements are more present from this harvest of Carignan. Full and mineral in the body with expressive, lively fruit. Very, very alive. Good fruit aromas along with crushed flowers and a definitive slate aspect. Silky, smooth, and even across the palate. Balanced and perfect in the finish with just a touch of astringency. Acidity and alcohol are immediately noticed in the nose as being unbalanced and what fruit remains is dying quickly. In the body, only tertiary alcohol notes remain. My fellow tasters rated this wine quite highly, but I suspect it’s only due to Parker and Wine Enthusiast having given it a 96 and 95 respectively many years ago. I tasted it last May as well at the Tast del Decenni 2015 and found it to be nearly the same when tasted blind. Ferran scored it even lower. It peaked two years ago. Round, curiously sandstone mineral notes alongside crisp red fruits. Still full and balanced in the mouth but with the tannins just on the cusp of starting to unravel. Balanced minerality that still carries the fruit very well without smothering it. Floral violet notes very present along with licorice, and fennel. Rich and elegant in the body with full, rich tannins and the red fruits showing splendidly. Dark, dark fruits of blackberry along with herbal notes of fennel, rosemary, laurel, and a pinch of white pepper. Thick and brooding on the palate it’s jumping with vibrancy and holds minor touches of chocolate in the finish. Many years left in it.